The quiz below requires some mastery in reactions, intermediates, and step-by-step mechanisms. Not ready? Start by gaining your foundation in the Acetal Tutorial Video Series! Scroll to the very bottom of this quiz for a link to the FREE quiz solutions PDF (Coming Soon!) to ensure you’ve got this down. The solutions walkthrough video is available in the Orgo Study Hall Video Library! If the aldehyde or ketone can react twice show the intermediate along with the final product. Hint: Hemiacetal and hemiketal form as intermediates for the acetal and ketal products As Seen in the Acetal Overview Video. in the following acetal protecting group reactions. Hint: You don’t need to work the entire problem. Review the reactant/product trick in this Acetal Overview Video. Acetals are often used as protecting groups for complex synthesis reactions. Show how you’d bring about the following transformations. Pay special attention to potential unwanted side reactions. This quiz was solved in an Orgo Study Hall member workshop. Not a member yet? Click for study hall details. FREE solution PDF to follow in a few days! Need to Review? 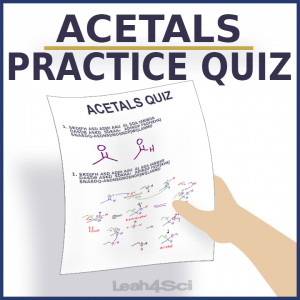 Study the Acetals Series! Looking for more? Join the Study Hall! You’ll have unlimited access to Video Solutions of all the Practice Quizzes and so much more! Find an error on the quiz or solutions? Let me know here! !